We could have chosen any number of locations - but our move to Federation House is far more than coincidence. Why did we choose each other? Solidarity & Community. It’s at the heart of what we do here at Northcoders. On one end of the spectrum, it’s about the success of the North. On the other end, it’s about the difference we can make to individuals. The Federation’s Co-op believe that by working together, our environment can be far more productive and ultimately more creative and successful - a sentiment we absolutely share. Compassion. A core Northcoders value is this: we care. We will all be better off if we are kind and open. Federation’s core values of openness, social responsibility, honesty and caring for others resonated with us. Equality & Inclusion. Just like our new neighbours at The Federation, we’re steadfast in our commitment to a fair, unbiased society where everybody has the same opportunities. For example, to help get more women into technology, we ourselves fund two #WomenInTech scholarships per cohort. The Co-op’s Federation House building is being transformed into a buzzing digital hub for pioneering creative, collaborative technology and digital companies, with the likes of Thoughtworks deciding to share the space. Companies at Federation House want to be part of something bigger - something worth more than the sum of its parts. Everyone here believes in the highly influential role the technology, creative and digital industries can have in truly turning the North into a Powerhouse. We exist to help the North prosper by providing her businesses with the coding talent it really needs. We believe we have a very real, very compassionate solution, so not only do we feel it makes total sense to be right here at the heart of it all - it’s affirming and exciting to be a part of the Federation House project. Federation House rests in the heart of Manchester’s innovation district N.O.M.A., right between Manchester Victoria, the central retail district and the Northern Quarter. It’s the largest development project in the UK (even larger than Media City UK!) and backed by The Co-operative Group. Want to grab some lunch? There are literally hundreds of choices within a 10 minute walk - and the restaurants at the Printwork and the Corn Exchange are just the beginning. Want to do a bit of shopping at the end of the day? Take a 3-minute stroll down to the Arndale Centre, Manchester’s huge central shopping centre. Places to be? Victoria Station is within 200 metres, and Shudehill tram and bus stations are just outside the building. Looking to chill out in the evening? The Northern Quarter, crammed with bars, restaurants, cafes, clubs, live music venues, shops and much more is just on the other side of the tram stop right outside of Federation House. Northcoders has already made a huge difference to the lives of many. But we believe we can change many more lives - and we believe Northcoders is making a real difference in the North. But our impact is limited unless we can grow. We’ve come a long way from our first cohort of 10 students, which began just over 15 months ago. The time has come to fly the nest of our 1900 sq ft offices in The Sharp Project, with new premises totalling 4000 sq ft - a huge, open workspace and a smaller lecture room. More air, more space, more light - and more future Northcoders. 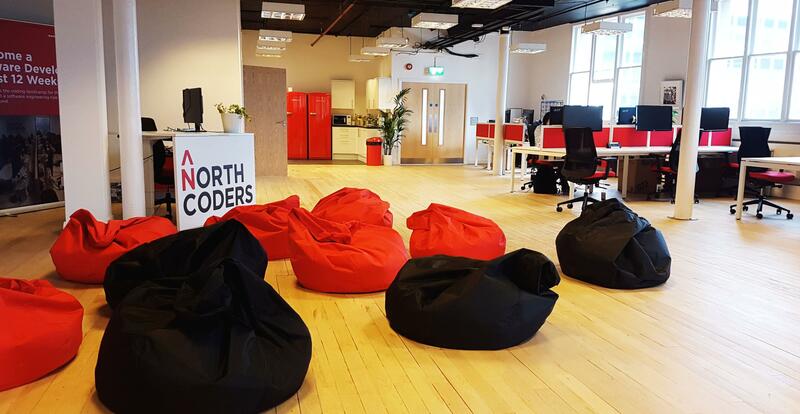 We’d love to give you a tour of our new premises, and show you more of what Northcoders do.